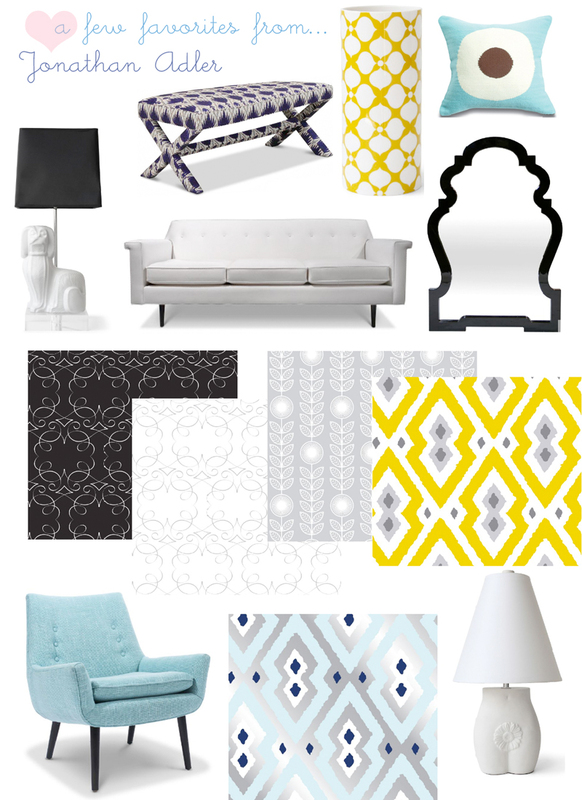 I'm always inspired when I visit Jonathan Adler's website because he is a real design dynamo constantly showing us something new and cheery in the world of interiors. I'm keeping my fingers crossed that someday he'll open a shop in mainland Europe so I can shop more frequently but I know this much: when I'm in New York this summer I'm going to raid his crackhouse of happiness and bring home some goodies for sure because I've never been to one of his stores and well, it's about time I change that! Have you had a chance to recently view his interior design portfolio? The home of Liz Lange, at least her country home, is shown in glimpses below. I can see most of these things fitting together nicely in a room or in a series of connected rooms - like a living room and an attached dining area, home office, or entryway. The fresh touches of blue, green and yellow cannot help but let the sunshine in. How could one ever dread mornings with a kitchen to greet them for breakfast like this? What strikes me most is her owl umbrella holder as I won something similar on eBay awhile back (and blogged about it here). My umbrella stand has a name, I've called him Oscar, and when he arrived in my boxes from America I quickly lifted him out to ensure he was crack and chip-free and he was in perfect condition. So now he is perched in my hallway and each day when I arrive home I'm greeted by this sweet ceramic creature. Hey, color me crazy but I love reminders of my favorite things dotted around my home. Owls have always been my favorite bird, my mother used to bring me to Brookgreen Gardens a few times a month during my childhood to see the birds - the owls were the ones I was most mesmerized by. I could stare at them and try to engage them for hours, so enthralling... The fascination still continues. I often walk into the forest around the corner from my home and I hunt for owls sometimes right after the sun sets, the time of night when there is still enough light to make out silhouettes and a perfect time for owl spotting. I found a massive brown one just the other day, I do not know what kind it was, and wanted so badly to scoop him up and take him home with me. What I would do with this magical creature then, I have no clue, but I've always wanted to own an owl and now I do - my ceramic pal Oscar who sits in my entryway day after day holding my collection of umbrellas. And it looks like Liz Lange has one too. What animal are you naturally attracted to and do you have this animal in your home - perhaps as bookends or a sculpture? Maybe an art print? What do you connect with in the images above? Any accents that particularly call out to you?